Is marriage the new rhino in the room? Could it be completely extinct within the next couple of years? If we can wipe out a whole species in a couple of generations, I see no reason why the institution of marriage shouldn’t be next. The one thing you can say about the human race is that we’re resourceful when we need to be. If something isn’t working for us, we find a way around it. That’s why we went from horses as our main form of transportation, to Uber. There’s certainly less horse poop to clean up now. With a fifty-something percent divorce rate, one could reasonably argue that marriage isn’t working for us anymore. But then nothing seems to last forever these days. (Cue the world’s smallest violin.) A fridge used to last more than 20 years, these days you’re lucky if it sticks around for five without leaving a puddle on the floor. So, with the world shifting on its axis, people are starting to ask the inevitable question, is there a more modern way to do marriage? One idea being floated is the ten-year wedding contract. Less forever and ever till death do us part, and more, forever and ever, till the ink dries. 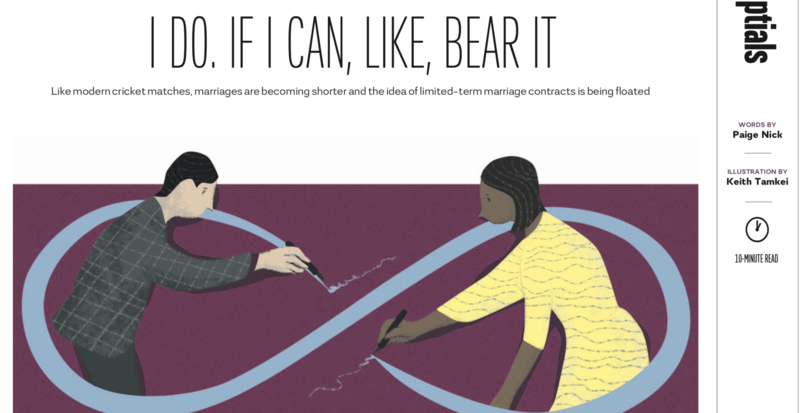 Couples draw up a contract and lay out their mutual goals for the relationship. Is it to have kids, for companionship, a passport maybe? For mad-crazy love, or to build a family, a business or an empire? They negotiate the financial terms during the relationship, and what would happen should it end. Same for plans and outcomes for any kids involved. Then they sign on the dotted line and agree to stay together for a decade. In year nine, they reevaluate things and either shake hands and go their separate ways with everything pre-worked out, avoiding animosity. Or they renegotiate the terms on a new ten-year contract, including updated financial and emotional terms and conditions. There is a certain practical business-like logic to it that appeals to me. But I can’t help wonder if it isn’t a very millennial response? Is it the equivalent of that annoying habit that’s plagued this generation, were everyone gets a participation trophy? Helping people feel more successful at something they kind of weren’t at all successful at. Okay so you didn’t crack a lifetime, but hey you made nine years, eight months and twenty-seven days, and that’s pretty good too, well done you, here’s your Noddy badge. Although in this day and age, I guess ten years is nothing to sniff at. It’s certainly longer than most of my knickers last. Hey, nobody expects you to stay in the same job forever. They say the average person changes jobs about ten to fifteen times in their career. Most spend five years or less in one job. Not that I’m calling marriage a job, I think the pay is better in a job, and it comes with perks. Marriage doesn’t come with medical aid, paid leave or a retirement policy. Sometimes it doesn’t even come with your own parking space. I just hope we aren’t setting ourselves up for disaster. What happens if one day even ten years starts to drag, then what will we do? Cut it down to seven, or five? Or maybe we’ll just micro-dose marriages. We could be like weekly boarders, or we could just be married on weekends. Great article – so well timed!